1 Thaw raspberries for about 30 minutes. Meanwhile beat honey and eggs in a bowl with whisk attachment of hand mixer until creamy. 2 Stir in milk. Combine flour and baking powder, add to egg mixture in 2 additions and stir briefly. Set batter aside. 3 Soak gelatin in a bowl of cold water. Use an electric mixer to beat ricotta and powdered sugar in a bowl until creamy. 4 With the bottom of a small ladle push thawed raspberries through a fine sieve or puree in a blender. 5 Put dripping wet gelatin in a small pot, add raspberry puree and dissolve over medium heat. Gently fold into ricotta mixture and chill for 10 minutes in the refrigerator. 6 Lightly grease a round waffle iron with vegetable oil and bake 4 waffles in succession; each should take 2-3 minutes depending on the iron. Cool on a wire rack for about 10 minutes. 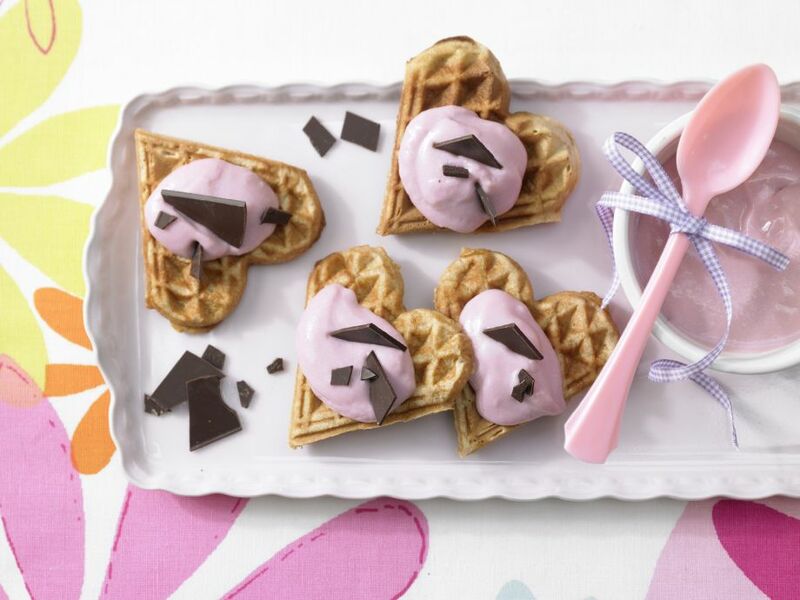 7 Carefully cut or break waffles into 5 hearts, place on a serving plate and spread with raspberry ricotta cream. 8 Break chocolate into pieces, sprinkle over the ricotta cream and serve. So cute and a great healthy alternative to heavy pancakes or waffles! I can't wait to share these at my next brunch.